Shop signed West Indies cricket memorabilia with autographed items from the players. Signed West Indies cricket bats, shirts, caps, balls & photos. All signatures come with a certificate of authenticity, fast worldwide shipping and free UK delivery, many have signing proof! Colloquially (and now officially) known as the ‘Windies’, the West Indies national cricket team have long been formidable rivals for England and Australia. The multi-national cricket team represents a variety of countries and territories throughout the Caribbean – 16 to be exact – including Trinidad and Tobago, Barbados and St Marten. The Windies have been a strong side for a very long time – from the early 1970s to the 1990s the West Indies side was the most successful both in Test and One Day International cricket. The ICC Cricket Hall of Fame is packed with players from the West Indies – many are widely regarded as some of the best in the world. These include Sir Everton Weekes, Malcolm Marshall, Lance Gibbs and Sir Garfield Sobers. Cricket was first played in the West Indies in the late 1800s, when sides from the region were selected to play visitors from England. In 1928 they became the fourth nation to be granted Test cricket status. The side represents a blend of sovereign states and territories including Jamaica, St Lucia, Barbados, Anguilla and the US Virgin Islands. Teams are selected from players across the board, and there are venues throughout the region. These include the Queen’s Park Oval in Trinidad, the National Cricket Stadium in Guyana and Windsor Park Stadium in Dominica. The West Indies cricket side is known for success – having been ranked 1st for the ICC Test, ODI and T20 Internationals. The side has won the ICC Cricket World Cup and the ICC World Twenty20 twice apiece. They were the very first team to win World Cups back to back, appearing in three consecutive World Cup finals between 1975 and 1983. 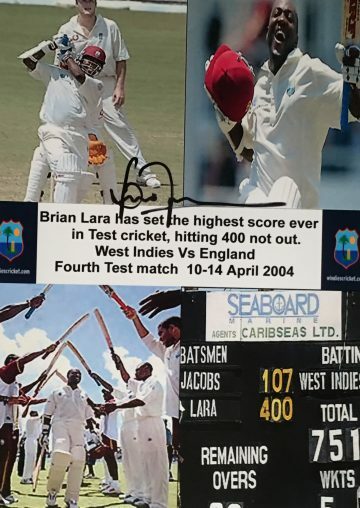 If you’re looking for signed West Indies cricket bats, balls, shirts, photos and other memorabilia you’re sure to find a great selection here at Firma Stella. Our hand-picked collections feature a variety of extra-special items including signed West Indies photographs spanning the Windies’ incredible history and numerous achievements.